THE TUC must organise a national day of action in support of the junior doctors’ dispute and our NHS, the Public and Commercial Services union said yesterday. The union’s general secretary Mark Serwotka wrote to the TUC yesterday afternoon to ask that the proposal is discussed at this morning’s general council meeting. The general council is the TUC’s ruling body. Yesterday morning hundreds of Unison delegates joined a march from the Brighton conference centre to join junior doctors on their picket line at Brighton General Hospital. The march was called by Brighton and Hove trades council and Sussex Defend the NHS. Delegates from the Unison Health Conference joined with other trades unions and community groups on a lively picket line outside the hospital. He went on to thank Unison for their support and said a special thanks to the consultants inside who were covering for them. Speaking from the 200-strong picket outside Kings College Hospital, London, Dr Jack Granville in Respiratory medicine said: ‘I’m here on the picket line at King’s College Hospital oppposing the damaging, unsafe and unfair contract that Jeremy Hunt is wishing to impose on junor doctors. ‘I also want to oppose the government’s austerity agenda, cuts and privatisation. ‘The NHS in its current form is already struggling. King’s A&E Department had its worst winter ever. There were many unsafe situations created. The hospital was struggling to discharge people, with no beds in which to admit people. ‘That is a result of the government’s decimation of the social care budget due to cuts to councils, and is the consequence of the government attitude to health and social care. Dr David Herbert said: ‘I’m a junior doctor, two years working for the NHS and I have seen conditions get worse and worse, not just for doctors, but nurses, health care assistants, phlebotomists, absolutely everyone, and for patients. We are all working under extreme pressure at the moment and this contract will make a situation which is barely manageable untenable in the future, so I am here striking for better conditions. Dr Patrick said: ‘It is really a shame that the other unions like Unison and Unite have been so tentative in their commitment. The sea of opinion might change even more when the public realise that this strike action today – with the full walkout – won’t be to the detriment of people’s health. Sophie Herbert, junior doctor in General Medicine, said: ‘Hunt has refused to talk to junior doctors in public which seems very suspect. We believe he wouldn’t have a leg to stand on when confronted with the truth. He has failed to listen to our concerns that the contract will harm patients and instead he is just repeating his government’s spin and propaganda. At St Thomas’ Hospital Sian Ashby, GP trainee, said: ‘We are quite determined we don’t want to work under this new contract. It affects staffing numbers and gender discrimination. We are not being listened to by the government. We have the support of nurses, physiotherapists and all the other health professions. ‘The PFI and the Health and Care Act, all these are pushing the NHS into privatisation. James Connor, a GP who came down to London from Banbury to join the picket said: ‘I am here to voice our general concerns that the NHS is being run into the ground in order to justify privatisation. ‘We have the best, most efficient and most equitable healthcare system in the world. At Northwick Park Hospital, where 200 pickets turned out, Sarah Krrar said: ‘I have been nine years a junior doctor and was six years a medical student. I have seen the deterioration of the service we have provided over the last five years because of the cuts. Cuts have coincided with a massive increase in demand for the service. Dr Jenny Abthorpe said: ‘Over 70,000 operations are cancelled every year because of lack of funding or beds. They only quote how many operations hae been cancelled on the day of our strike. On Christmas Day and bank holidays, hospitals have the same cover as the previous junior doctors strike days, however no one complains. Junior doctors Kate Felton (paediatrics) and Jacob Ellis (child psychology) spoke to News Line amidst an animated group with strong opinions. Jeremy Hunt says that we are a block to a seven-day working contract. If you really want elective options at weekends then you need nurses and other staff as well. Can we afford that? We already work seven days! ‘We have an overwhelming lack of confidence in Hunt. He has shown no insight into the way the NHS works and his attitude is insulting to our intelligence. He cannot even say what seven-day working means; it is not sorted and no-one knows. Our union has, on the other hand, been very clear: if you stop the imposition then we will negotiate. ‘He has rejected a very fair offer from our union. How do you even model a contract when you don’t even know how many doctors you have got? There is already a massive loss of talent as people come up for retirement, leaving massive holes in the service, all aggravated by this imposition, which will make new doctors leave. ‘It’s ridiculous to impose a contract that compromises patient safety and puts further strain on an already stretched NHS,’ BMA rep Raj Shah told News Line on a lively picket line outside the Royal Free Hospital, northwest London. On a well attended picket line at Barnet hospital Dr Amy Bowes told News Line: ‘At present I work in medicine for the elderly in my first year of training and it was disappointing to start my career in such a position and to have a health minister so insistent on imposing an unfair contract. Martin Goodsell brought the East London, Unite Community banner, he said: ‘We support the junior doctors 100%. We are community activists engaged in housing and anti-eviction campaigns and against zero-hours contract employers. ‘All these campaigns must come together. The teachers and doctors should come out on strike together. We need an all-out NHS strike. 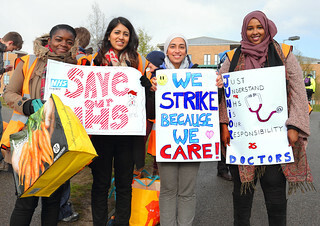 This is about the unions working together to resist rivatisation and co-ordinate actions and strikes.’ Len Weiss, chair of the Unison Waltham Forest retired members branch, said: ‘We are here to support the junior doctors on their picket line. 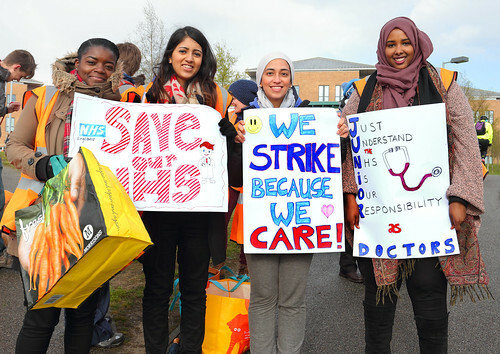 The fight for the NHS and to keep it fair and safe is too important to give up,’ said Hammersmith Hospital junior doctor Julia Prague on the picket line yesterday. Ann Sturdy, an acute medicine junior doctor said: ‘Since I became a junior doctor four years ago we’ve always been short of beds, short of equipment and short of staff. At Ealing Hospital the striking doctors set up their picket alongside the West London Council of Action’s daily picket which is fighting against the closure of the Charlie Chaplin children’s ward and all children’s A&E services on 30th June. A&E doctor and BMA member Veronica Jones spoke about imminent planned cuts at Ealing Hospital, saying: ‘I think not having a paediatric A&E is of real concern because children will be turning up and if it is an emergency then they will have to be transferred to Northwick Park, which will lead to unnecessary delays which could be very dangerous.